DVDs featuring old family photos, videos and films in digital form are proving to be popular gifts. FALMOUTH – Paul Stimpson died in 1967 in a helicopter crash in Vietnam. His daughter, Shelley Magiera, was born that year. She never met her father. But Stimpson, a Portland resident, left behind four 8-millimeter films — home movies of his wedding and footage from Vietnam. The film sat in storage until this year, when Magiera’s mother and adoptive father, Carolee and James VanValkenburgh, transferred it to DVD. This year, Magiera watched the home movies for the first time. 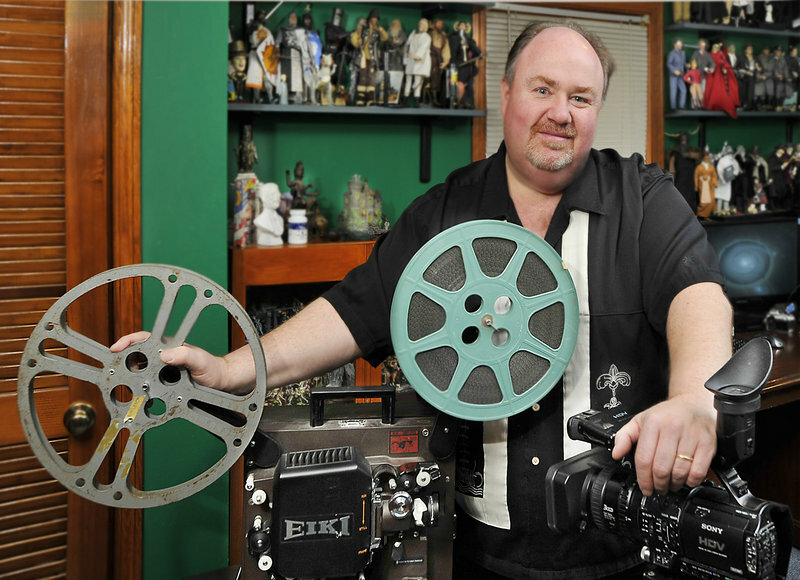 Owners of local film companies say more and more people are doing what the VanValkenburghs did, transferring old movies and photographs into digital formats to preserve family records for the next generation. Business has been especially brisk this holiday season. Tabor said the holiday rush started in September and has gained steam since then. She took all the orders she could handle in time for Christmas. Tabor thinks the demand to preserve family history is up in part because more families are split up and spread out. But also, she said, a digital generation is inheriting their parents’ heirlooms. “Children of the Depression and post-Depression are dying off, and (films and photographs are) coming into the hands of people who know we can do something with this,” she said. Groff, the self-proclaimed “projector geek” who converted Paul Stimpson’s 8-millimeter films, works from his home office in Falmouth. On Groff’s desk are two oversized computer screens. The surrounding shelves support shoeboxes stuffed with old reels. Groff hits the “play” button on his computer. The screen lights up and a silent, color film begins. It’s a summer day. The grass is green and the sky is blue. Five or six kids sit at a picnic table, smiling for the camera. The images are grainy and tinted orange. Groff thinks the film was shot at a Fourth of July party sometime in the 1950s. Groff said the videos highlight “the best times” in people’s lives. Birthdays. Weddings. Holidays. Picnics. Family reunions. He said he sometimes converts films from the 1920s and 1930s. Many are from the post-war years. “People take for granted what they have. Like the Vietnam film. It is extraordinary,” Groff said. Many of the films are damaged, burned or torn. The trick, for Groff, is feeding worn tapes through the rollers of his 1970s-era Eiki projector. Groff plays the films on a white screen, and records them on high-definition video. “It takes time and patience. It’s a Zen thing. I spend a lot of time with impossible films,” he said. He charges $25 to $35 for a small reel of film, though he often agrees on a flat fee for large projects. Tabor said that digitizing a few photos might cost about $20. But converting old films to DVD can be expensive. “We (did) a stack of movies the other day and it was about $700,” she said. For some customers, the memories are worth the price. Bernie Tanguay of Cumberland hired Groff recently to digitize photos of her father-in-law, who turned 100 in November. For the project, Tanguay collected photos spanning more than 90 years. She plans to give her children and grandchildren copies of the images on DVDs for Christmas. “For our kids and their kids, it will be something to hold on to and say, ‘This was my great-grandfather,’ ” she said. Magiera’s video of her father, Paul Stimpson, also has special meaning. Stimpson, who was a lieutenant and a helicopter pilot in the Army in the 1960s, shot much of his film in Vietnam. In the film, Magiera said, her father interacts with Vietnamese. In some of the scenes, he jokes and goofs off. The film also includes footage of Stimpson marrying Magiera’s mother. He died in the helicopter crash in 1967, but his films survived. Magiera watched a DVD copy this fall with her two daughters, ages 14 and 17, and her mother and adoptive father.